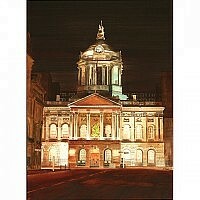 Keith is a featured artist at The Winter Arts Market, St George’s Hall, in the Liverpool Echo on December 4th 2012. 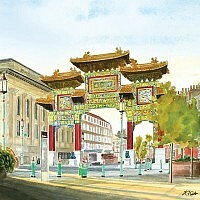 January 2011 Artists & Illustrators Magazine published a 4 page article on my paintings of Liverpool. An article called ‘Masters of Watercolour’ featuring my painting of Falkner Square, Liverpool is in the March 2009 issue of Artists & Illustrators magazine. Gerry Marsden kindly autographed one of Keith’s original paintings of The Royal Iris of the Mersey ferry and Liverpool Waterfront. It was auctioned by Radio Merseyside’s Roger Phillips for Claire House Hospice at Thornton Hall in summer 2008 and raised £1,100 for the charity. We organised a group exhibition for the members of Liverpoolgallery.com at Zoe’s Place Baby Hospice, Liverpool on 12th May 2006. I donated this original painting of The Isle of Skye, and the evening raised £400 for the hospice. Pictured here with Penny Williams of Zoe’s Place.